It is extremely unfortunate that the urgency behind King's words here still ring true to this day, but that is precisely why we STILL cannot wait. Buy this book for the first time or to reread it. Give it to a friend. Give it to an enemy. Give it to a stranger (or a family member for that matter). But most importantly, follow his advice, react to his words/message, and DON'T WAIT!! In this remarkable book—winner of the Nobel Peace Prize—Dr. King recounts the story of Birmingham in vivid detail, tracing the history of the struggle for civil rights back to its beginnings three centuries ago and looking to the future, assessing the work to be done beyond Birmingham to bring about full equality for African Americans. Above all, Dr. King offers an eloquent and penetrating analysis of the events and pressures that propelled the Civil Rights movement from lunch counter sit-ins and prayer marches to the forefront of American consciousness. Since its publication in the 1960s, Why We Can’t Wait has become an indisputable classic. 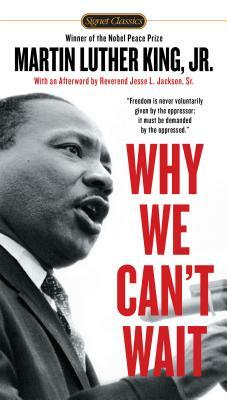 Now, more than ever, it is an enduring testament to the wise and courageous vision of Martin Luther King, Jr.
Includes photographs and an Afterword by Reverend Jesse L. Jackson, Sr.
“No child should graduate from high school without having read this book. In telling the story of the third American Revolution, it is as integral to American history as the Declaration of Independence.”—Reverend Jesse L. Jackson, Sr.